It's been way too long since I spent any real time in the Studio, a result of being between print projects and the work that goes into teaching my 5 classes this semester. 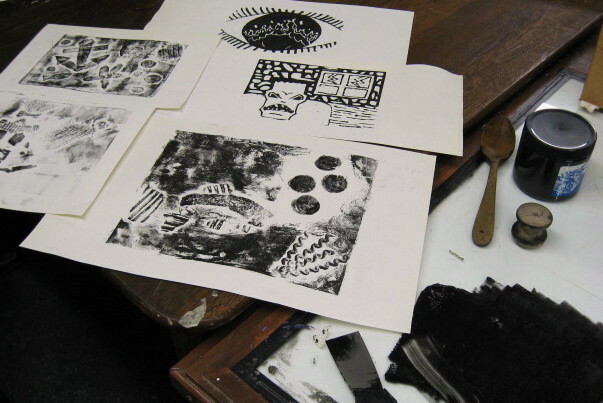 And today when I did finally get to spend a few hours there, I couldn't completely escape my professor job, devoting some time to printing some late student work- woodcuts and collagraphs. Most of the students printed theirs in class, but I don't want to have to bring the printing materials week after week, not to mention that helping students with whatever we're working on in given week doesn't leave me much time to get these done during the class. With that done, I moved onto the next task of the day, also school related, and involving the book above, featuring the art of Hieronymus Bosch. Exactly what that's about will have to wait until another time, assuming that it is completed as expected. And then I finally did some work toward some art of my own. At this point I'm leaning toward moving on to another boardwalk print as the next major project, and that is likely to be the locker/shower room scene. It's one of the original ideas (one with significant ties to the original ukiyo-e prints), the general composition has been worked out for a long time, and I've been sitting on the various figure sketches for almost a year now. Didn't do any actual drawing today, but just started cataloging all the figures that may populate the scene, scattered in multiple sketchbooks. Within the next few weeks I hope to finalize the layout of the interior and the location of all the characters. Once that's settled I'll get some photos up here on the blog. Another long Wednesday drew to a close in Belmar at the latest figure drawing session. The first drawing of the night was absolutely terrible, to the point where I got up and moved to the other side of the room as the pose continued. The second drawing was significantly better, but nothing to get excited about. 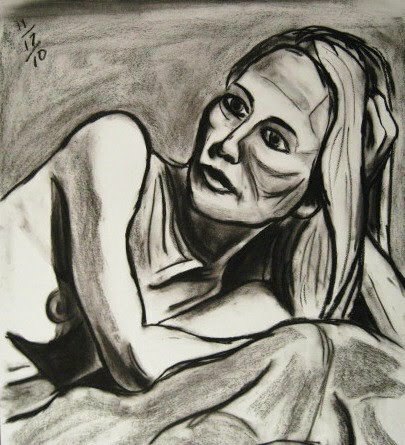 The second half of the evening was a new pose and drawing location, and this one (45 minute, shown above) came out far better than either of the first two. So the third drawing saved the evening for me. I may miss the next couple of drawing groups with end of the semester school related stuff, so tonight's practice will have to hold me a while. So Why Go All the Way to Newark? Haven't had much to report the past few weeks. Still working out what the next print will be. There may be a show coming up in December, but I'll wait on announcing that until I have more details. But I did run across one thing worth mentioning here. I was looking at the entertainment section of yesterday's Star Ledger and saw something very familiar. There was a full page review of a current 3 person show at Aljira, the well known and highly regarded art space in Newark. 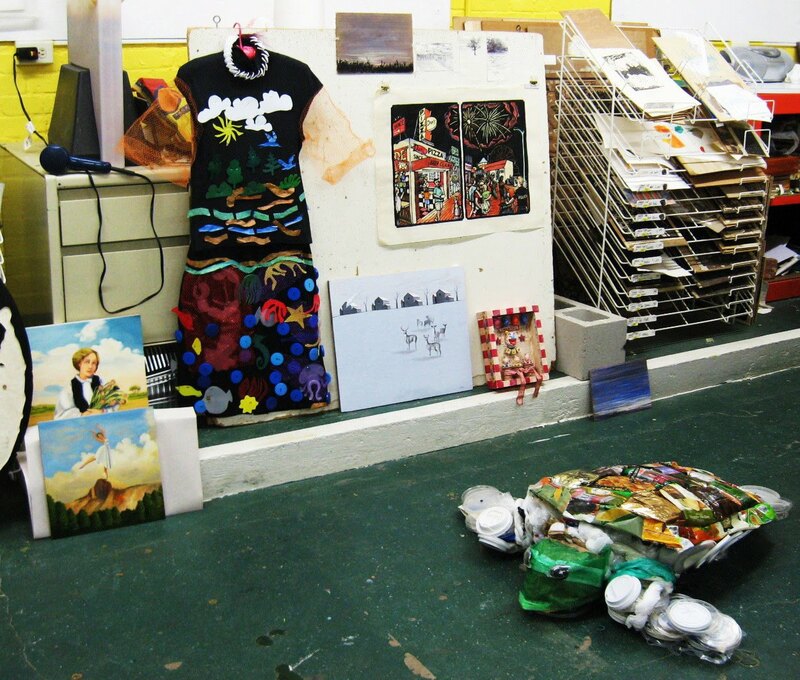 One of the artists is Dahlia Elsayed, a well established artist in the metropolitan area, and a friend of the Studio. 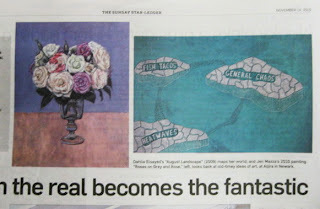 The article included one image of each artist's work, hers being the one on the right in the above image. I recognized it immediately as I have seen it before...at the Studio. Dahlia brought it to one of our critique sessions a little over a year ago, where I recall it got a very positive response. I've got nothing against Aljira (I was in a few shows there back in the 90's) and if you're in the Newark area it might be worth a stop. But this just goes to show that if you want to see some cool art long before it gets to the walls of a hip urban gallery, come to one of our critique nights. And maybe someday you can brag about knowing some interesting artist/artwork before everyone else in your crowd did. I remember a little piece of a dream I had last night. I had been spending time with some people (friends and/or family) but they had gone off to do something else. My plan was to join them later, but for the moment I had a little time to myself to spend...at the Boardwalk. Don't remember if it was a specific one, just that I had some difficult decisions to make. Which one tasty boardwalk food would I eat? Which games or activities would I enjoy in my limited time? I wandered around while I considered the options. Unfortunately, I don't remember what decisions I made. 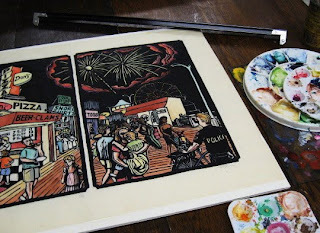 But maybe the dream itself is a little reminder that it may be time to get back to my boardwalk series. I started the afternoon driving up to the Boatworks to pick up some art. I knew that I had to pick up my piece from the After Sunset show, and planned to ask about the 8 supermarket prints that have been hanging in the nearby bank since the Belmar Urban Myth show ended. 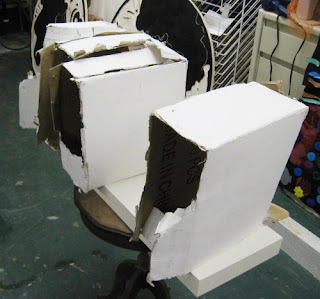 It turned out that the latter had already been returned to the BAC, and I had the foresight to bring one of my custom boxes with me, so I was able to pack them all up. 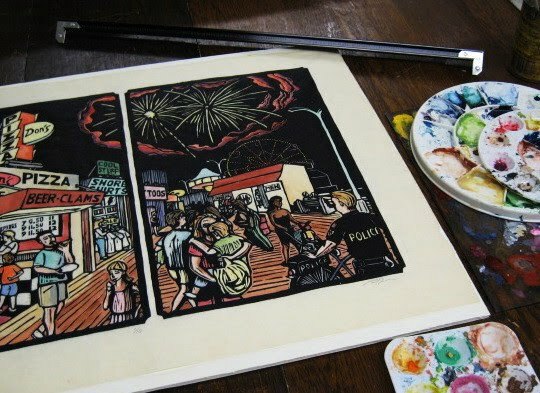 I continued up to the Studio, where my plans had included thinking about the next boardwalk print. However, since I now had the framed night scene print with me, I brought it inside, opened it up, and did some additional coloring, as shown above. Not much- just those few spots that I had skipped in my rush to get this copy to the exhibition intake, and a few minor changes to reflect things from my second copy. I also went ahead and numbered it as part of the edition, now that I know this is the final state of the print. After it dried, back in the frame and ready for the trip home. My work on the print is now officially done. But as I said, my plan today was to consider the boardwalk series, and had brought my notes with me. From my original list of ideas, there are 5 remaining. I have specific reference material at hand for most of them, so I have a few options for the next one. And as of now, no specific deadline that demands I do a particular one next. Over the next week or so I plan to try coming up with possible layout sketches for one or more of the ideas, and if one seems particularly ready to go, that will be the next project. Results will be here as soon as I know myself. Commuting up to north Jersey during rush hour is never a fun experience, but today was worse than usual. Early tv news mentioned a big accident on the GSP just a little before my exit, a 10 mile backup already before I even left home. I hit that pile of cars about 20 miles out, and if that jam extended all the way to my exit, at the rate we were moving it might take another 4 hours to get there. However after about 5 miles of stop and go things started to pick up, and I arrived only about 30 minutes later than usual. And a happy surprise- plenty of parking. Today's class introduced a print project, and that also always raises my spirits. My drive to Belmar in the evening was a lot shorter, and no traffic, but when I arrived at the Boatworks the parking lot was almost completely full. I guessed right that most of the cars were for next door, but there was a pretty big crowd there to draw, 8 other artists lined up shoulder to shoulder in an arc facing the model's platform. In the end I had to take a position behind the model, but I can't complain. 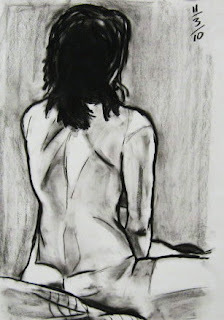 The 25 minute drawing I did from back there (see above) turned out to be my best one of the night. When I arrived at the Studio this evening, about ten minutes before the critique's scheduled start, there was a small crowd waiting in the basement for me to open up. More arrived soon after, so we had a total of 9 participants, all of whom have been there before. As usual, a very diverse group of artworks. 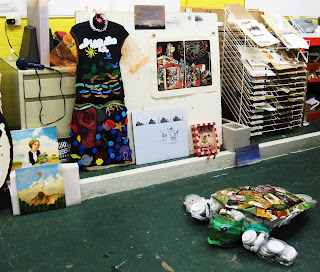 The above photo shows Jill's paintings, Edy's dress (with attached recycled plastic pieces), Jane's paintings and drawings, my just finished print, Katie's painting, Michelle's box assemblage, and Lisa's sculpture (on the floor). 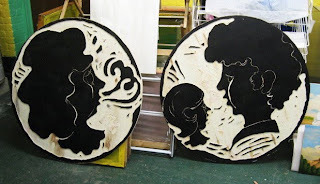 Molly showed two bodies of work- the large round wood carvings in progress (intended to eventually be printed on cloth) above, and dozens of blocks with attached relief prints (some of her little robot characters). 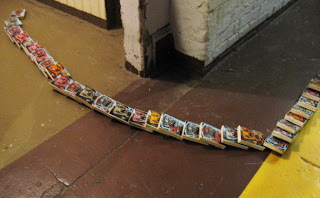 Molly had us line up the robot blocks in the hall as seen above, and then knocked them down like a row of dominoes (below), and idea based on something said in October's critique. 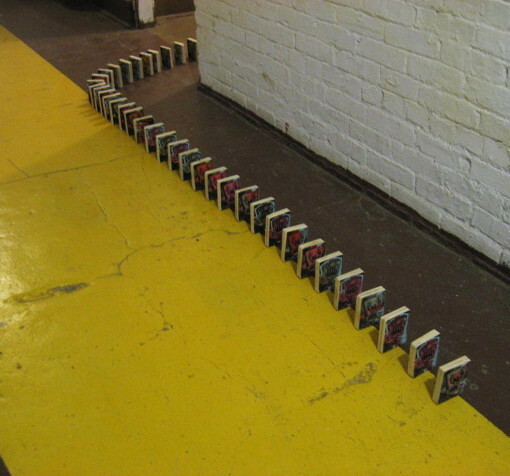 Adam's contribution was more of his painted boxes, as seen above. Other than a different presentation (the shelf/table instead of a wall), the boxes aren't much different from previous versions. What was different was the meanings he associated with the boxes this time around. Usually the critique is a good evening of discussion, but tonight's was particularly spirited, in a good way. 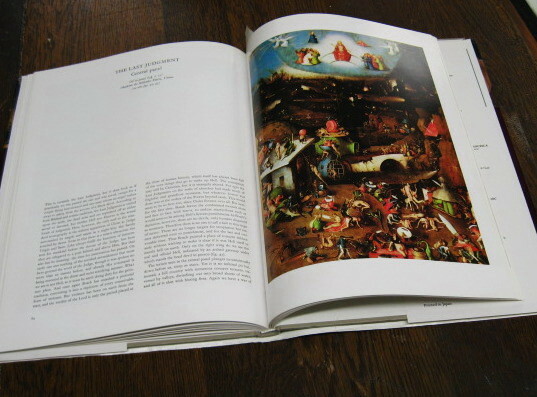 People often had differing opinions regarding individual works, but everyone brought up interesting reactions to whatever particular artwork was being discussed. As a result, people tended to ignore the timer we use to try to keep things moving, and we finished about 30 minutes later than usual. As for my print, this is the first time anyone there saw the finished version. Got a very good reaction in general, with a few people saying they thought it the best one yet in the boardwalk series. The more involved part of the discussion about my print began with a question about color choices, and led to talking about memory image versus pure research as a focus in the work. My feeling was that the former was more important, since nothing in the scene is a copy of any existing boardwalk, but rather it's all inspired by bits and pieces of at least 5 different boardwalks. However, on location research was key to the color choices, which I doubt I would have made without my direct observations.